SAN FRANCISCO, Calif. (May 20, 2010) — Today at the Google I/O developer conference in San Francisco, leading industry players announced the development of Google TV—an open platform that adds the power of the web to the television viewing experience, ushering in a new category of devices for the living room. Intel, Sony, and Logitech, together with Best Buy, DISH Network and Adobe, joined Google (NASDAQ: GOOG) on stage to announce their support for Google TV. Over the past decade, the Internet has created unprecedented opportunity for innovation and development across the world, but so far the web has largely been absent from living rooms. With Google TV, consumers will now be able to search and watch an expanded universe of content available from a variety of sources including TV providers, the web, their personal content libraries, and mobile applications. Google TV is based on the Android platform and runs the Google Chrome web browser. Users can access all of their usual TV channels as well as a world of Internet and cloud-based information and applications, including rich Adobe® Flash based content – all from the comfort of their own living room and with the same simplicity as browsing the web. When coupled with the Intel® Atom™ processor CE4100, Intel’s latest system-on-a-chip designed specifically for consumer electronics, the new platform will offer home theatre quality A/V performance. Sony and Logitech said they would be delivering products based on the new Intel Atom processor and running Google TV later this year. While Google TV is designed to work with any TV operator, at launch the user experience will be fully optimized when paired with DISH Network. Google TV expands video choice from the hundreds of channels available today through a pay TV provider to the vast storehouse of video content available through the web and streaming videos. The Google TV experience is complemented by the ability to watch streaming video from leading content platforms, including Netflix, Amazon Video On Demand, and YouTube. 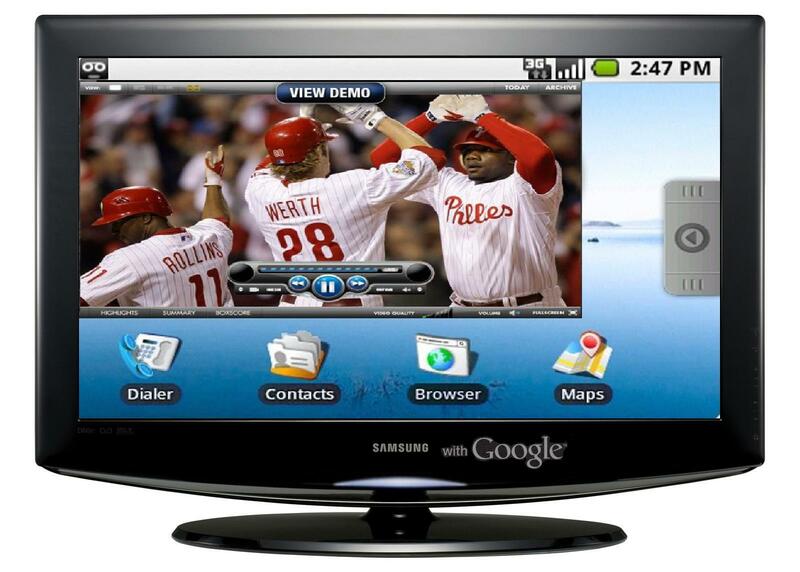 Google TV will also have the capability to run apps from the Android Market. To navigate the array of content that will now be available through a single device and on a single screen, Google TV introduces an integrated search experience to help viewers easily find relevant content across over-the-air and pay-TV channel listings, DVR, and the Internet, as well as a picture-in-picture layout to access multiple windows simultaneously. Google TV also features an innovative home screen to help viewers quickly organize their favorite content and personalize their TV viewing experience. Some of these features are only available with advanced integration from DISH Network. Sony announced plans to introduce “Sony Internet TV,” the World’s first TV lineup incorporating the Google TV platform. The first models are planned to be introduced in the U.S. market in the Fall of 2010 with the lineup featuring both a standalone TV model and set top box-type unit incorporating a Blu-ray Disc drive. Logitech will introduce a companion box that brings Google TV to existing HDTV home entertainment systems, easily integrating with any brand of HDTV and set-top box. The companion box will incorporate Logitech’s Harmony® remote control technology, and will include a controller that combines keyboard and remote control capabilities. The company also has plans to introduce an HDTV camera and video chat for Google TV, along with additional choices for navigation and control, including apps to turn a smart phone into an advanced controller for Google TV and home-entertainment systems. DISH Network has been a key partner with Google on advanced integration development for Google TV. The two partners began a joint trial over a year ago with more than 400 DISH Network and Google beta users. Based on the continuous feedback from the trial, Google and DISH Network have built the optimized Google TV experience that seamlessly integrates traditional TV, DVR and web content. The demonstration at I/O highlighted the unique opportunity developers have to help shape the future of Google TV. Today Google announced that they would soon release a set of TV specific APIs for web applications, encouraging web developers to begin building unique web applications for use on television sets. Later this year Google will also release an updated Android SDK, which will support applications built for Google TV. Google also plans to open source the Google TV platform to help spur innovation in the industry and so that other developers can benefit from the project. The long term goal is to collaborate with the entire developer community to help drive entertainment in the living room forward and to introduce the next generation of TV-watching experience. For more information about the project visit google.com/tv.